Last week I introduced you to Bob’s Red Mill Everyday Gluten-Free Cookbook, and shared a delicious recipe for a carrot bread with coconut and cardamom (which you should definitely check out if you haven’t already). I gave you some insight into what the cookbook contained, and promised that I would be back with some more thoughts, and another recipe – which is what we’re gonna get into right now! This time around, I wanted to share with you one of the savoury main dishes featured in the cookbook. I narrowed it down to a few options, and then let the boyfriend decide which it would be – always good to have buy in from your household taste-tester. 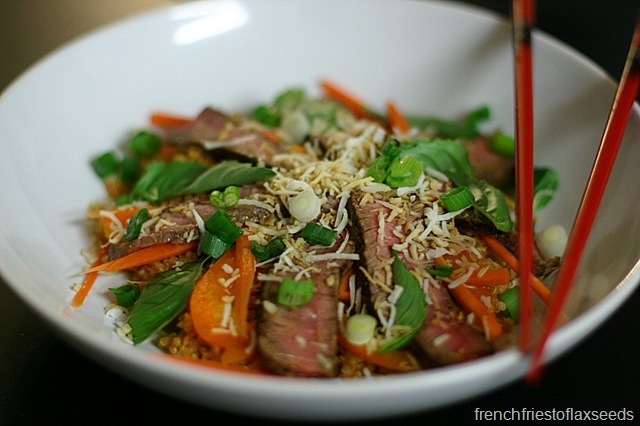 Without hesitation, he chose Thai Grilled Steak and Quinoa Bowls, probably because it meant he would get steak (something I don’t cook very often). What he didn’t realize is that it was probably the easiest/quickest cooking dish I had chosen, so I was down with it as well. Honestly, this dish was so easy to throw together, used many ingredients I usually have on hand, and was so flavourful! It uses a red thai chili paste to cook the quinoa with, which is a great idea – I can see doing this for a variety of side dishes. 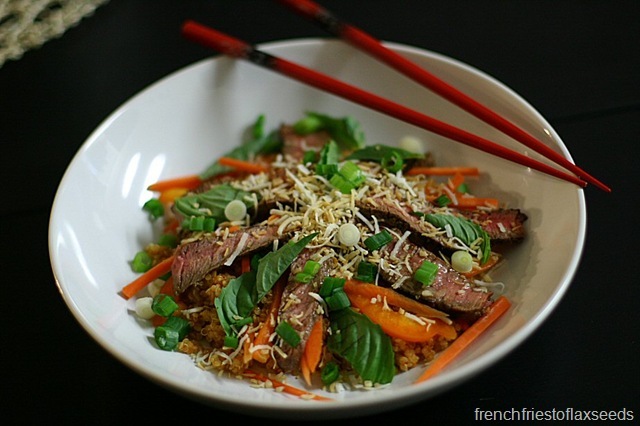 The directions gave me a perfectly medium cooked steak, and the lime-coconut dressing pulled the whole dish together. I added some julienned carrot and green onion, as well as the suggested bell pepper, toasted coconut, and basil, just for a little extra veggie hit. It hits all the flavour notes like any good Thai dish should, looks gourmet enough to serve for company, and is easy enough to make on any busy weeknight. As the boyfriend says – it’s a keeper! 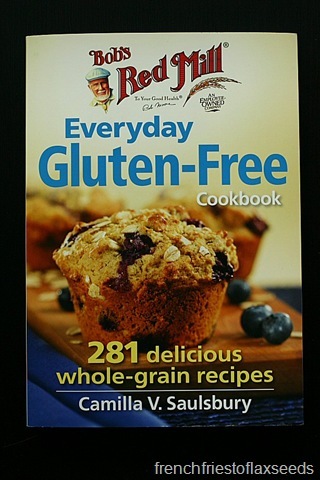 Overall, I’m a fan of the Bob’s Red Mill Everyday Gluten-Free Cookbook. It is filled with plenty of easy to follow recipes that will appeal to a broad range of tastes. It makes gluten-free cooking accessible, whether you have just been diagnosed with a gluten allergy/intolerance, or want to cook meals for friends and family that can’t eat gluten. And even for a gluten-eater like me, it gives me some more inspiration on how to incorporate a variety of whole grains into my daily eats. Definitely check it out if you are looking for a straightforward gluten-free cookbook – and enjoy the whole grain goodness! 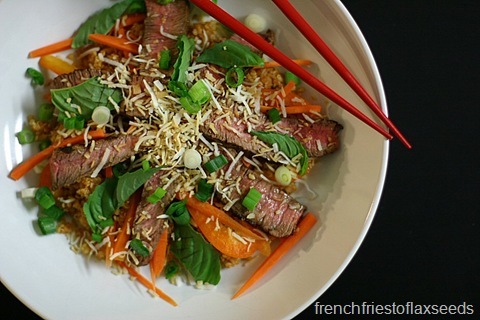 Take a trip to Thailand with these boldly flavoured steak and quinoa bowls. 1. Preheat BBQ or grill pan to medium high heat. 2. In a medium saucepan, combine quinoa, curry paste and water. Bring to a boil over medium-high heat, stirring to combine curry paste. Reduce heat to low, cover and simmer for 12 to 15 minutes or until liquid is absorbed. Remove from heat and let stand, covered, for 5 minutes. Fluff with a fork. 3. Meanwhile, pat steak dry with paper towels. Lightly rub with coconut oil. Sprinkle with salt and generously season with pepper. Grill on preheated barbecue, turning once, for 5 to 6 minutes per side for medium-rare, or until desired doneness. Transfer to a cutting board and let rest for 5 minutes. 4. In a small bowl, whisk together brown sugar, 2 tbsp coconut oil (see tips) and lime juice. Season to taste with salt and pepper. 5. Divide quinoa mixture among four bowls. 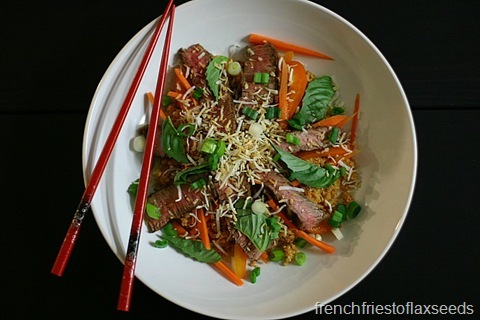 Thinly slice steak and arrange on top. Sprinkle with any of the suggested accompaniments, as desired. Drizzle with dressing. Tips: An equal amount of curry powder (any heat level) can be used in place of the curry paste. When rubbing the steak with melted coconut oil, be sure to measure out the oil for the dressing first and put it in a separate bowl to avoid any cross-contamination with the raw steak. As well, discard any extra melted oil that you’ve dipped a brush on your fingers into when rubbing the steak.